Explain how and why Lowitja was given the name of Lois after she was born. Describe the circumstances that led to Lowitja being separated from her mother when two years old. Explain what you think Lowitja means by saying that when “half-caste” children such as her were taken away it was “meant to be for our good”. Do you think she believes this to be correct? 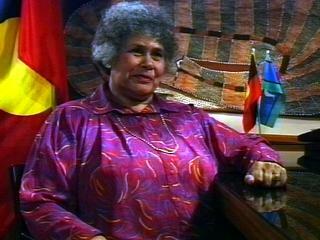 Research and write a 500-word biography of the life of Lowitja O’Donoghue, drawing attention to her importance as a campaigner for the rights of Indigenous Australians. Ensure it is written in your own words. Re-tell the incident of Lowitja’s removal from her home as a short story. You may wish to discuss in class first how you would present the story’s viewpoint – whether it should be in the third person or first person. If the latter, who are the choices of narrator? Consider which parts of the story you would emphasise for impact. In pairs research the findings of the 1997 “Bringing Them Home” report (also known as The Stolen Children report), then prepare a poster display of the findings and recommendations. In small groups survey ten people who are not at your school about their awareness of The Stolen Generations, and the “Bringing Them Home” inquiry. You should first discuss in class the questions for your survey. For example, are your interviewee subjects informed by media reports? Have films such as Rabbit-Proof Fence influenced their thinking? As a class combine your group’s findings and come to a conclusion about the extent of people’s awareness and views on the issue.